Size of Male: 33-40 lbs., 18.5-20 in. Size of Female: 33-40 lbs., 17.5-19 in. The Kerry Blue Terrier is an energetic, fun-loving dog who makes a fine family dog. They are fast, strong, intelligent dogs who do very well in all dog activities such as obedience, agility, herding and tracking. They are loyal and affectionate toward their families and usually very gentle with children. The Kerry Blue is an active dog so they do best with an active owner who can provide them with plenty of exercise and some training. They are also very high-spirited and they can be strong-headed so they need an owner who matches them. There is a mixture of fact and legend surrounding the Kerry Blue Terrier. The dogs seem to have been first observed in the mountains of County Kerry in Ireland. According to legend, the ancestor of this dog breed was a blue dog who swam ashore from a shipwreck. The coat of this dog was so striking that he was bred to all of the female Wheaten Terriers in the surrounding area which produced the Kerry Blue breed. There’s no way to know if this is true, although it is possible that the Portuguese Water Dog played a part in the Kerry Blue’s development and he might have swam ashore from a shipwreck. 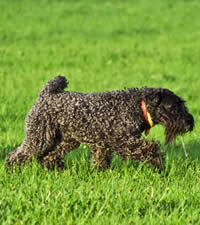 Other dogs which may have helped develop this dog breed include the Bedlington Terrier and the Irish Terrier. There may be some herding dog influence as well. The dogs were used as all-around farm dogs and as the farmer’s hunting dog. Since Irish Wolfhounds were often kept as a deterrent to poachers, the Kerry Blue was often used by people to hunt without detection. Otherwise, these dogs were used on farms to kill vermin and other small animals that plagued farmers. The breed became associated with Irish nationalism in the early 20th century. This was the first dog to be registered with the Irish Kennel Club when it was founded. Also known as the Irish Blue Terrier, this is a rowdy, animated dog. They are very playful, comical dogs and they enjoy making people laugh. If dogs have a sense of humor, this one certainly fits the description. They are very affectionate with their family and they much prefer to be with their people. They like to rough house. As former farm dogs they are also alert and they can make a good watchdog, although they are not prone to attacks. These dogs usually get along well with strangers but they can have problems with other pets in the household unless they are introduced to them at a young age. They can see other pets as prey. Kerry Blues are intelligent and they do well with dog training. In fact, since these dogs are rambunctious and high-spirited, they need a lot of training so the owner can stay in control. Living Environment – These medium sized dogs can do well in an apartment provided they get plenty of exercise. They prefer to be close to their owners but they are fairly active indoors so make sure they get plenty of exercise. Grooming – They are among dogs that do not shed much, but they still need regular grooming – at least weekly. They will need to be trimmed at least every six weeks to keep their coat looking in good shape. Diet & Exercise – Dietary needs are considered normal. They do require regular daily exercise and they do best if they have their own yard. If you need to walk your dog, you will need to make sure you don’t allow your Kerry to walk you since they can be very head strong. Health – The is a generally healthy breed and they are long-lived. They can be prone to canine hip dysplasia, canine hypothyroidism, dry eyes, cataracts, entropion, cancerous growths on the skin and other skin problems. Progressive neuronal abiotrophy (PNA) can also occur. Of course, some of these conditions may be very rare. If you are interested in this dog breed, you should talk to a breeder about possible dog health problems. In the dog training department, Kerry Blue Terriers are intelligent dogs and they can do very well in many dog activities such as obedience, agility, herding and tracking. They can be headstrong dogs who want to do things their way so you will need to be firm with your dog. As with most dogs, it’s best not to use harsh training techniques. These are fun-loving dogs and they respond very well to positive dog training (praise, rewards). Make training fun for your dog and he will be happy to learn.